Nagpur: “Every religion has certain traditions and rituals. The Shastra pujan by the Rashtriya Swayamsevak Sangh (RSS), which is part of its annual ritual Vijayadashami, is an example of such rituals. Despite our differences we should celebrate the bond of brotherhood. I support shastra pujan but oppose its use” said Ramdas Aathawale, Minister of State for Social Justice and Empowerment here on Wednesday. Athawale was speaking at the press conference at Ravi Bhavan where he discussed the future plans of his party and also addressed issues like bringing petrol, diesel under GST regime, allegations of MeToo etc. While throwing light on the role of his Republican Party of India-A (RPI-A) in upcoming elections, the Minister said that, if BJP-Shiv Sena alliance fails for 2019 Lok Sabha election, RPI will definitely support BJP and will work with full potential to win them at least 30 seats. 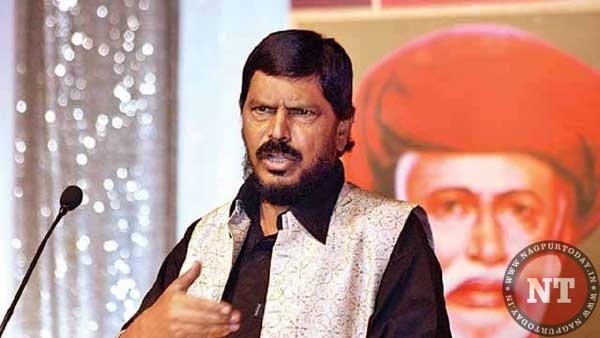 Athawale further said that the BJP-led government is aware of the aguish among people regarding the rising petrol, diesel prices. “The Modi Government will take care of this problem before it turns severe, even if it means by bringing petrol, diesel under GST”.